Background and Aim: The aim of the study was to investigate the mast cell (MC) concentration in the liver tissue of patients diagnosed with chronic hepatitis C and to determine whether there was a correlation with clinical and pathological characteristics of patients. Materials and Methods: The study was conducted on liver biopsy samples from 60 patients with chronic hepatitis C. Clinical and laboratory data were obtained from follow-up records. Stained liver biopsies were examined. 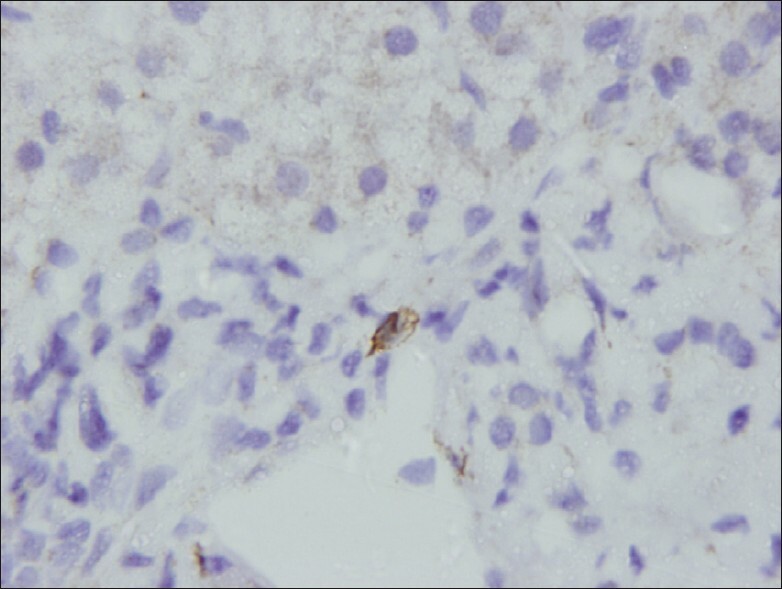 Immunohistochemical staining was performed by using an anti-c-kit antibody. Patients were divided into four groups (minimal, mild, moderate, and severe) based on the intensity of inflammation and their hepatic activity index scores and into two groups (no-mild, moderate-severe) according to fibrosis grade. Results: Among patients enrolled, 60.0% (n=36) were men with a mean age of 48.3±12.7 (range 18-64) years. The mean number of mast cells per portal area in the liver was 0.87±0.86 (0-4.0). No correlation was found between alanine aminotransferase (ALT) and hepatitis C virus (HCV). Ribonucleic acid ( RNA ) levels and the degree of inflammation of cases with number of mast cells and liver steatosis (P>0.05). As the degree of fibrosis increased in the liver so did the number of mast cells in portal areas (P=0.001). On the other hand, no correlation was found between the degree of fibrosis and the number of MCs in the sinusoids and steatosis (P<0.05). The increase in the number of MCs in the portal areas correlated with an increase in liver steatosis (t: 0.02, P=0.04). Conclusion: In light of these findings, it appears possible that MC accumulation in chronic HCV patients may be used as an indicator of fibrosis and possibly be considered in the follow-up of these patients. The aim of the study was to investigate the mast cell concentration in the liver tissue of patients diagnosed with chronic hepatitis C and to determine whether there was a correlation with clinical and pathological characteristics of patients. The study was conducted on liver biopsy samples from 60 patients with chronic hepatitis C who were being treated and followed-up by the Department of Infectious Diseases and Clinical Microbiology between January 2009 and April 2010. Diagnosis and treatment were arranged in line with criteria. Liver biopsies were obtained from patients who were positive for anti-HCV and HCV RNA, following individual written informed consent. Evaluations were performed in the Department of Pathology. Patients with autoimmune disease, a history of alcohol use, co-existing liver disease, diabetes mellitus, malignancy or who were receiving immunosuppressive treatment were excluded from the study. Clinical and laboratory data on patients were obtained from patient files. 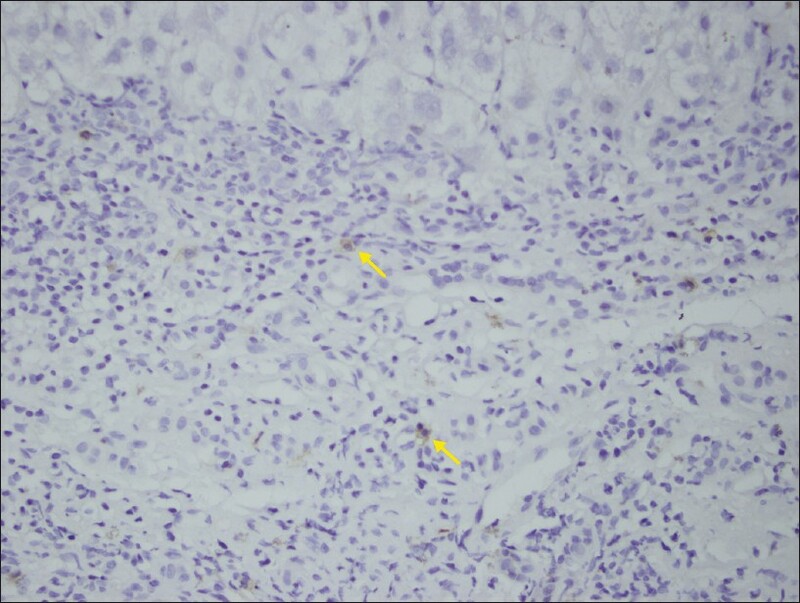 Biopsy samples from the patients were stained with hematoxylin eosin, reticulin, and Masson's trichrome; the slides were examined to determine inflammation intensity, fibrosis, and the degree of steatosis. Samples with less than seven portal areas were not included in the study. The intensity of inflammation and the degree of fibrosis were determined according to the Ishak Modified Knodell system. During investigation of inflammation, the total hepatic activity index (grade) was calculated by adding individual scores of periportal inflammation, piecemeal necrosis, confluent necrosis, and lobular necrosis. Cases were evaluated in terms of steatosis and were graded based on Brunt's scoring system. According to this system, cases were divided into three groups; patients with fatty degeneration in 30% or less of hepatocytes were classified as having mild steatosis, patients with fatty degeneration in 30-60% of hepatocytes were classified as having moderate steatosis and patients with fatty degeneration in more than 60% of hepatocytes were classified as having severe steatosis. Cases with no fatty degeneration in hepatocytes were classified as negative for steatosis. Patients were divided into four groups based on the intensity of inflammation and their hepatic activity index scores; cases with scores of 1-3 were regarded as minimal, 4-8 were accepted as mild, 9-12 were regarded as moderate and 13-18 were regarded as severe. In terms of degrees of fibrosis, each case was initially evaluated according to the Ishak system. Upon evaluation, cases were classified into two groups: the first group was composed of cases with scores between 0 and 2 with no fibrosis or mild fibrosis, and the second group had scores of 3-6 with moderate-severe fibrosis. For immunohistochemical examination, paraffin blocks of patient samples were taken out of archive, cross-sectioned at 4 μm and placed on slides. Cross-sections were de-paraffinized with xylene and rehydrated with an alcohol series. For the antigen retrieval, cross-sections were kept in a microwave oven in a solution of 1 mmol/L EDTA (pH:8.0) for 20 min. Cross-sections were kept in 3% hydrogen peroxide for 5 min to inactivate endogen peroxidase. As a primary antibody, CD117 (Dako, polyclonal rabbit-antihuman, code no: A4502) was added and then the sample was incubated for 80 min. Following addition of the primary antibody, biotinized anti-mouse and anti-rabbit IgG were applied to the cross-sections for 45 min, followed by incubation with streptavidin peroxidase, and then the cross-sections were stained with 3,3´-diaminobenzidine tetrahydrochloride. Hematoxylin was used for cross-staining. Prepared samples were examined under a light microscope for CD117 (C-kit)-stained mast cells [Figure 1]. This evaluation was performed according to the recommendations of Wataru et al. Based on this approach, mast cells in hepatic lobuli and portal areas were individually counted and evaluated. Mast cells in the hepatic lobuli in zones 2 and 3 were counted and evaluated in at least 10 locations under magnification (×200), and the number of mast cells in each area was calculated. Mast cells in portal areas were evaluated in at least 7 portal regions under magnification of the microscope (×200), and the number of mast cells per portal area was calculated. Statistical analysis was performed with the SPSS 11.5 program. Descriptive statistics and Kendall's Tau correlation test were used for analysis of the data. A P-value <0.05 was considered significant. Among patients enrolled, 60.0% (n=36) were men with a mean age of 48.3±12.7 (range 18-64) years. The mean alanine aminotransferase (ALT) value of patients was 70.0±57.2 (range 27-260) U/L, and the mean HCV RNA level was 3.9×10 6±4.9x10 6 (range 2.9×10 4 -3.8x10 7 ) IU/mL. Of patients, 46 (76.6%) had genotype 1 and 14 (23.4%) had genotype 2. Classification of inflammation and fibrosis and mean number of mast cells in liver biopsy samples of patients are shown in [Table 1]. The mean number of mast cells per portal area in the liver was 0.87±0.86 (0-4.0). The mean number of MCs in the ten magnification areas of sinusoids (number of MCs in 2.2 mm 2 ) was 0.46±0.68 (range 0-2) [Figure 2], [Figure 3], [Figure 4] and [Figure 5]. The gender and age of the patients, levels of ALT and HCV RNA, the degree of inflammation and fibrosis in liver biopsies, MCs in portal areas and sinusoids, and the correlation with steatosis are shown in [Table 2]. No correlation was found between ALT and HCV RNA levels and the degree of inflammation of cases with number of mast cells and liver steatosis (P>0.05 for all). As the degree of fibrosis increased in the liver so did the number of mast cells in portal areas, and this difference was statistically significant (P=0.001) [Table 1]. On the other hand, no correlation was found between the degree of fibrosis and the number of MCs in the sinusoids and steatosis. Additionally, it was determined that the increase in the number of MCs in the portal areas correlated with an increase in liver steatosis, and this difference was statistically significant (t: 0.02, P=0.04). In this study, which evaluated liver biopsies of chronic HCV patients it was determined that: (a) there is no correlation between age and gender of patients and the concentration or number of MCs. (b) No correlation was found between MC concentration and serum ALT levels. In chronic HCV infection, aminotransferase levels are normal in about one third of patients. In some of these patients with normal aminotransferase levels, progression to histological damage was observed. Therefore, fluctuating ALT levels may not directly affect MC accumulation. 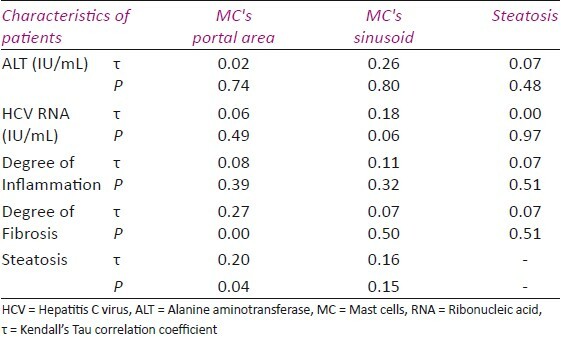 (c) No significant correlation was found between the degree of inflammation and the concentration of MCs in both the sinusoidal and portal areas. Similar to this study, in patients with HCC that was due to chronic HCV infection, no correlation was found between MC concentration and stages or grades of patients. In the same study, although a causal relationship was not established between HCC and MCs, it was indicated that they might have induced formation of new capillaries. (d) It was determined that as the degree of fibrosis in the liver tissue is increased, MCs in the portal area increased. Similarly, MC accumulation in the portal areas was found to correlate with an increase in the degree of steatosis. 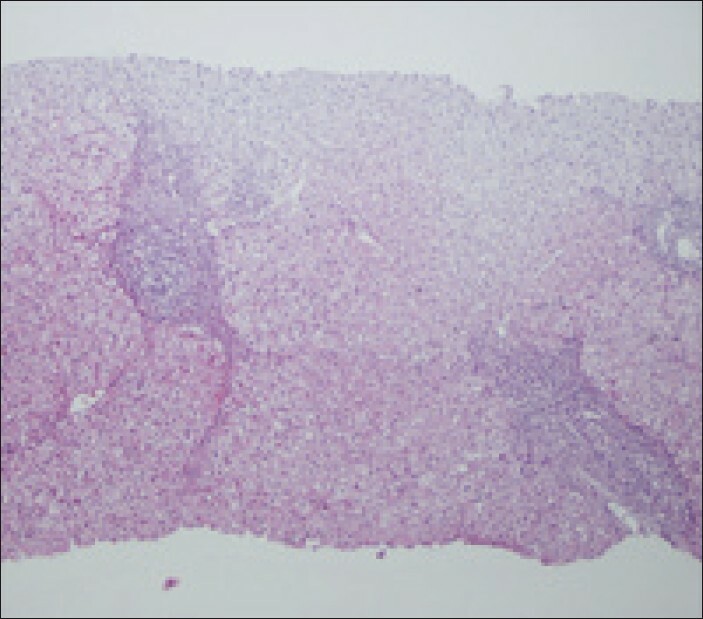 Hepatic steatosis is a frequent pathological finding in liver biopsies of patients with chronic HCV-related diseases. In vitro and in vivo studies suggest that the HCV core protein may induce lipid accumulation in transfected cells and transgenic mice. , It was also shown that HCV has the capacity to induce steatosis directly, by interfering with lipid metabolism that follows increased viral replication after entry of HCV into hepatocytes. In a study conducted by Leandro et al., it was confirmed that steatosis is significantly and independently associated with fibrosis in CHC. Upon evaluation of these studies, it is confirmed that fibrosis is increased in HCV infection. In the present study, we observed an increase in fibrosis and steatosis in portal areas with an increase and accumulation of MCs. In a related study performed by Franceschini et al., it was determined that the concentration of MCs is increased in patients with HCV infection and steatosis, compared to HCV patients without steatosis. Persico et al. indicated that in HCV patients, hepatic steatosis is a very critical co-factor for liver disease, due to its ability to interact with the antiviral response and its ability to trigger HCC development. Several risk factors for liver disease progression are known for both chronic hepatitis C (CHC) and non-alcoholic fatty liver disease (NAFLD). These factors are, high BMI, type 2 diabetes mellitus, older age and alcohol consumption and these can also affect the presence and the gravity of hepatic steatosis. In our study, patients with autoimmune disease, a history of alcohol use, co- existing liver disease, diabetes mellitus, malignancy, and patients who were receiving immunosuppressive treatment were excluded from the study. Unfortunately the BMIs of patients were not assessed in the study. This is a limitation of our study. However, we took into consideration other factors that lead to steatosis, indicated above and did not include these patients in our study. In conclusion, the number of studies that found a correlation between mast cell concentration and HCV is limited. In light of these findings, it appears possible that MC accumulation in chronic HCV patients may be used as an indicator of fibrosis and possibly be considered in the follow-up of these patients. Nevertheless, the sample size is too small and further large-scale studies are needed to verify this conclusion. We would like to acknowledge Dr. Ibrahim Koruk at Harran University, Faculty of Medicine for his valuable contribution to statistical analysis of the results. 1. Welle M. Development, significance, and heterogeneity ofmast cells with particular regard to the mast cell-specific proteases chymase and tryptase. J Leukoc Biol 1997;61:233-45. 2. Galli SJ. New insights into "the riddle of the mast cells": Microenvironmental regulation of mast cell development and phenotypic heterogeneity. Lab Invest 1990;62:5-33. 3. Eren U, Asti RN, Kurtdede N, Sandikci M, Sur E. The histological and histochemical properties of the mast cells and the mast cell heterogeneity in the cow uterus. Turk J Vet Anim Sci 1999;23:193-201. 4. Crivellato E, Finato N, Isola M, Ribatti D, Beltrami CA. Low mast cell density in the human duodenal mucosa from chronic inflammatory duodenal bowel disorders is associated with defective villous architecture. Eur J Clin Invest 2003;33:601-10. 5. Alter MJ. Epidemiology of hepatitis C virus infection. World J Gastroenterol 2007;13:2436-41. 6. Fartoux L, Chazouilleres O, Wendum D, Poupon R, Serfaty L: Impact of steatosis on progression of fibrosis in patients with mild hepatitis C. Hepatology 2005;41:82-7. 7. Hagmann W, Hacker HJ, Buchholz U. Resident mast cells are the main initiators of anaphylactic leukotriene production in the liver. Hepatology 1992;16:1477-84. 8. Bardadin KA, Scheuer PJ. Mast cells in acute hepatitis. J Pathol 1986;149:315-25. 9. Farrell DJ, Hines JE, Walls AF, Kelly PJ, Bennett MK, Burt AD. Intrahepatic mast cells in chronic liver diseases. Hepatology 1995;22:1175-81. 10. 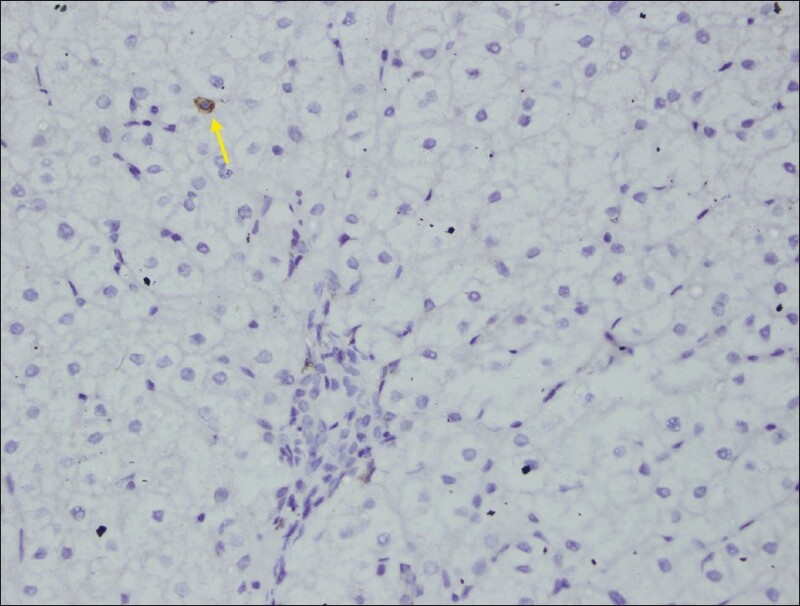 Rioux KP, Sharkey KA, Wallace JL, Swain MG. Hepatic mucosal mast cell hyperplasia in rats with secondary biliary cirrhosis. Hepatology 1996;23:888-95. 11. Armbrust T, Batusic D, Ringe B, Ramadori G. Mast cell distribution in human liver disease and experimental rat liver fibrosis. Indications for mast cell participation in development of liver fibrosis. J Hepatol 1997;26:1042-54. 12. Makhlouf HR, Ishak KG. Sclerosed hemangioma and sclerosing cavernous hemangioma of the liver: A comparative clinicopathologic and immunohistochemical study with emphasis on the role of mast cells in their histogenesis. Liver 2002;22:70-8. 13. Terada T, Matsunaga Y. Increased mast cells in hepatocellular carcinoma and intrahepatic cholangiocarcinoma. J Hepatol 2000;33:961-6. 14. Satomura K, Yin M, Shimizu S, Kato Y, Nagano T, Komeichi H, et al. Increased chymase in livers with autoimmune disease: Colocalization with fibrosis. J Nippon Med Sch 2003;70:490-5. 15. Franceschini B, Ceva-Grimaldi G, Russo C, Dioguardi N, Grizzi F. The Complex Functions of Mast Cells in Chronic Human Liver Diseases. Dig Dis Sci 2006;51:2248-56. 16. Grizzi F, Franceschini B, Chiriva-Internati M, Liu Y, Hermonat PL, Dioguardi N. Mast cells and human hepatocellular carcinoma. World J Gastroenterol 2003;9:1469-73. 17. National Institude of Health Consensus Development Conferece Statement: Management of hepatitis C. Hepatology 2002;36:3-20. 18. Ishak K, Baptista A, Bianchi L, Callea F, De Groote J, Gudat F, et al. Histological grading and staging of chronic hepatitis. J Hepatol 1995;22:696-9. 19. Brunt EM, Janney CG, Di Bisceglie AM, Neuschwander-Tetri BA, Bacon BR. Nonalcoholic steatohepatitis: A proposal for grading and staging the histological lesions. Am J Gastroenterol 1999;94:2467-74. 20. Yamashiro M, Kouda W, Kono N, Tsuneyama K, Matsui O, Nakanuma Y. Distribution of intrahepatic mast cells in various hepatobiliary disorders. An immunohistochemical study. Virchows Arch 1998;433:471-9. 21. Huntley JF. Mast cells and basophils: A review of their heterogeneity and function. J Comp Path 1992;107:349-72. 22. Nakamura A, Yamazaki K, Suzuki K, Sato S. Increased portal tract infiltration of mast cells and eosinophils in primary biliary cirrhosis. Am J Gastroenterol 1997;92:2245-9. 23. Gordon A, McLean CA, Pedersen JS, Bailey MJ, Roberts SK. Hepatic steatosis in chronic hepatitis B and C: Predictors, distribution and effect on fibrosis. J Hepatol 2005;43:38-44. 24. 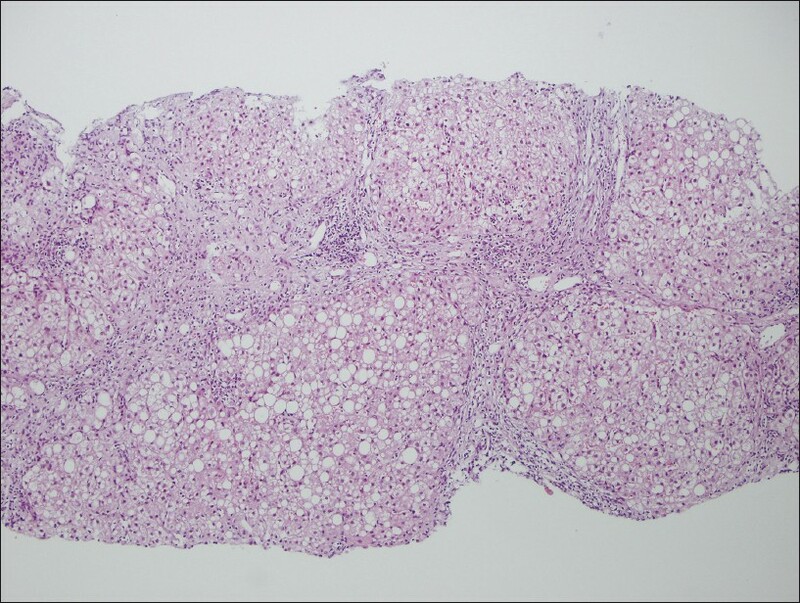 Minakari M, Sameni FK, Shalmani HM, Molaee M, Mohammad-Reza Z. Hepatic steatosis in Iranian patients with chronic hepatitis C. Med Princ Pract 2008;17:126-30. 25. Castera L, Hezode C, Roudot-Thoraval F, Lonjon I, Zafrani ES, Pawlotsky JM, et al. Effect of antiviral treatment on evolution of liver steatosis in patients with chronic hepatitis C: Ýndirect evidence of a role of hepatitis C virus genotype 3 in steatosis. Gut 2004;53:420-4. 26. Patel K, Zekry A, Mchutchison JG. Steatosis and chronic hepatitis C virus infection: Mechanisms and significance. Clin Liver Dis 2005;9:399-410. 27. Choi S, Diehl AM. Role of inflammation in nonalcoholic steatohepatitis. Curr Opin Gastroenterol 2005;21:702-7. 28. Ray SC, Thomas DL. Hepatitis C. In: Mandell GL, Benett JE, Dolin R, editors. Principles and Practice in Infectious Diseases, 7th ed. Philadelphia: Churchil Livingstone; 2010. p. 2157-85. 29. Moriya K, Yotsuyanagi H, Shintani Y, Fujie H, Ishibashi K, Matsuura Y, et al. Hepatitis C virus core protein induces hepatic steatosis in transgenic mice. J Gen Virol 1997;78:1527-31. 30. Yamaguchi A, Tazuma S, Nishioka T, Ohishi W, Hyogo H, Nomura S, et al. Hepatitis C virus core protein modulates fatty acid metabolism and thereby causes lipid accumulation in the liver. Dig Dis Sci 2005; 50:1361-71. 31. Lonardo A, Adinolfi LE, Loria P, Carulli N, Ruggiero G, Day CP. Steatosis and hepatitis C virus: Mechanisms and significance for hepatic and extrahepatic disease. Gastroenterology 2004;126:586-97. 32. Leandro G, Mangia A, Hui J, Fabris P, Rubbia-Brant L, Colloredo G, et al. Relationship between steatosis, inflammation, and fibrosis in chronic hepatitis C: A meta-analysis of individual patient data Gastroenterology 2006;130:1636-42. 33. Franceschini B, Russo C, Dioguardi D, Grizzi F. Increased liver mast cell recruitment in patients with chronic C virus-related hepatitis and histologically documented steatosis. J Viral Hepatitis 2007;14:549-55. 34. Persico M, Iolascon A. Steatosis as a co-factor in chronic liver diseases. World J Gastroenterol 2010;16:1171-6. 35. Clouston AD, Powell EE. Interaction of non-alcoholic fatty liver disease with other liver diseases. Best Pract Res Clin Gastroenterol 2002;16:767-81.